Tide Plotter is easy to use and lets you produce a tidal prediction in just a few easy clicks for any day during the year. 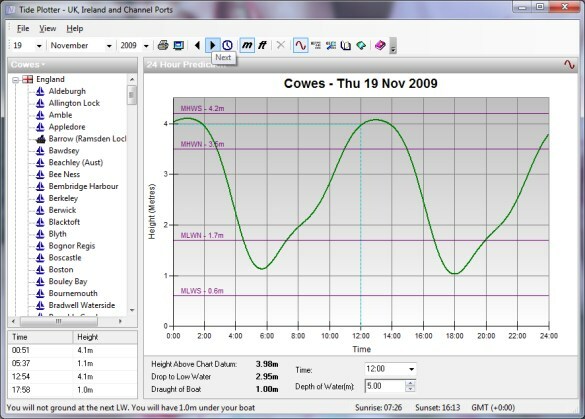 A new tidal stream component, this supplements the many extra features added over the years such as a GPS interface, to link the planning map to your GPS and exporting facilities to a spreadsheet comes after the route planner, the outline chart with tide stations, the 'height finder' feature, the tide log and an electronic book entitled 'Working with Tides', this explains the theory of tides with several practical exercises for you to work through. There is also a Logbook and a gallery of high resolution photos and images for personal use. Predictions can be shown in traditional monthly table form, just like in printed tide tables, or as daily graphs. Daily graphs show you every detail of a days tide. Double high and low waters can be seen clearly which is great when using waters such as Poole harbour which have very peculiar tides. In addition to use on your PC, Tide Plotter is ideal used on a laptop onboard a boat. If you haven't got a laptop to take on your boat then do not fear. Tide Plotter can print both monthly tide tables and daily graphs so you can have the information when away from a computer.